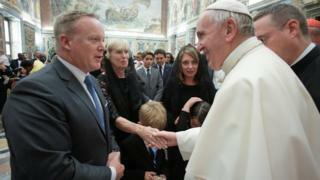 Former White House press secretary and devout Catholic Sean Spicer has finally managed to achieve his ambition of meeting Pope Francis. Mr Spicer was present as legislators and politicians from around the world gathered in Italy for an annual meeting at the Vatican earlier this week. Pictures later showed the former spin doctor shaking hands with the pontiff. US President Donald Trump and his entourage met the Pope in May, but Mr Spicer was omitted from the list. He finally got his audience with the Pope on Sunday, the Vatican confirmed to the Associated Press news agency. Despite expressing a desire in May to see the head of the Catholic Church, Mr Spicer was unable to join Mr Trump due to "a number of constraints from the Vatican". The meeting on Sunday took place with the nonpartisan International Catholic Legislators Network, as the group assembled to discuss the relationship between Christianity and politics. In May, Mr Trump was granted a short private audience with Pope Francis as part of his foreign tour. He was joined not only by his wife Melania, daughter Ivanka and son-in-law Jared Kushner, but also Secretary of State Rex Tillerson and National Security Adviser HR McMaster. Melania, a Catholic, asked the Pope to bless her rosary beads. Mr Trump later tweeted: "Honour of a lifetime to meet His Holiness Pope Francis. I leave the Vatican more determined than ever to pursue PEACE in our world." Mr Spicer quit as press secretary in July, reportedly in protest at an organisational shake-up and the appointment of communications director, Anthony Scaramucci. Mr Scaramucci was himself fired after fewer than 10 days in the post.